There are so many advanced moves in the wild frontier of calisthenics that it's easy to lose sight of the basics. It's true that heads spin at the mighty muscle-up. Hearts skip a beat in the presence of the fantastic human flag. Pupils pop at pistol squats. But these showpieces are built on a foundation of the fundamentals. What are those? Pull-ups, push-ups, squats and...is that it? For many people, yes. But I argue that there's another staple exercise deserving of celebration. It's a beastly bodyweight move that possesses all the power of the others, yet gets little of the glory. I'm referring to the dip. To me, the dip is a key component in developing true upper-body pushing power. So why don't more people do it? Perhaps because they don't know how to progress once they can manage parallel-bar dips for reps. Is the only way to add plate after plate of additional weight? Definitely not! When you can rep out on the standard parallel-bar dip, that's not the end, my friend. It's only the beginning! Here are five dip variations that can provide years of variety and vitality, offering an endless, tremendous triceps challenge! Don't get me wrong—push-ups are great. I do plenty of them! But I also think that the additional challenge provided by dips makes them especially valuable and worth including in your training, even if you already do push-ups. Think of the difference between a lat pull-down and a strict pull-up. With one, the ground (and a machine) gives you plenty of stability to work from. But once you're hanging from the bar, it's just you and your body weight—and everything immediately gets tougher! With dips, you similarly remove a primary point of contact—the feet—from the equation, thus putting a larger amount of weight on the arms than a push-up does. This results in a greater weight-to-limb ratio and makes your arms work even harder. But anyone who does dips regularly can tell you that it's not just the arms that get worked. Every muscle in your upper body gets pulled into the battle. This is why I consider dips to be in a class all their own. Whether you're in pursuit of more muscle, more strength, or—especially—more muscle-ups, you need to do them. This is the one many of us got acquainted with in high school gym class or at the playground. 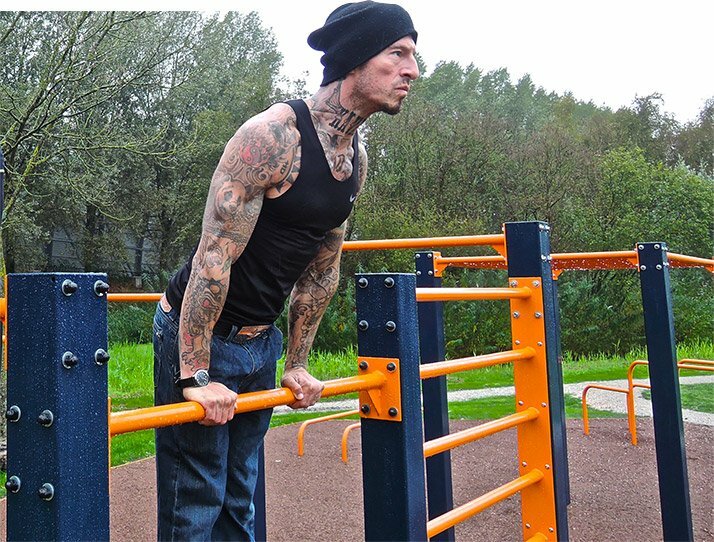 Grab the parallel bars tightly and lower yourself down, bending at the elbows and shoulders. Make sure your elbows point behind you instead of flaring out to the sides. This will keep the tension on your triceps and minimize shear forces on the shoulder. Keep your chest up and your abs engaged to get maximal gains from every repetition. When performing classic dips, the question of foot position inevitably arises. You'll see people performing them with straight legs, bent knees, and varying foot placements. While there is no definitive answer to which is "better," different positions will have different effects on the exercise. For example, keeping your legs fully extended with your feet slightly in front of you (sometimes called a hollow position) places greater emphasis on your core, making your body tighter and shifting your body weight in front of you. Conversely, bent knees and feet behind you can alter the leverage of the exercise, making it more mechanically advantageous and slightly more forgiving. Beginners may feel more comfortable in the latter position, and may even choose to cross their feet in order to generate more tension. I encourage you to experiment and find what works best for you. It will not be the same for everybody. The staggered dip is similar to the classic, except that you place one hand in front of the other while still on separate parallel bars. This unique variation targets the upper-body muscles from numerous angles and can be adjusted infinitely, just like you can adjust your hands and arms in push-ups. To ensure that both arms are training evenly, be mindful to practice equally on each side. Now we're getting tough. Hinge dips take your dipping game to the next level with a dramatic increase in range of motion. To perform a hinge dip, lower yourself in a deliberate and controlled fashion, all the way down, until your elbows and forearms come into direct contact with the parallel bars. It will take much more strength to lift yourself up from this position than with a standard dip, so don't expect to do it for reps the first time. 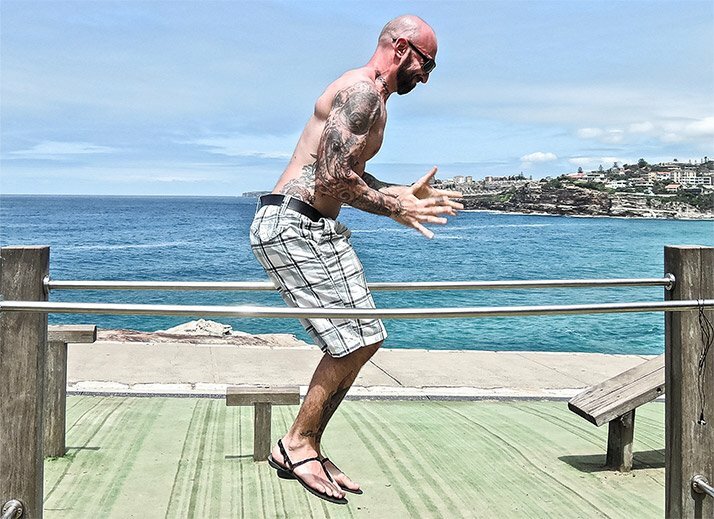 If you've been doing your dips bodybuilder-style with your feet behind you, this variety could pose a unique balance problem. When this happens, try performing hinge dips to extend your feet out in front of you to act as a counterweight, because your center of gravity will be behind you at the bottom of the rep. These dips require explosive power, but they also help build it. 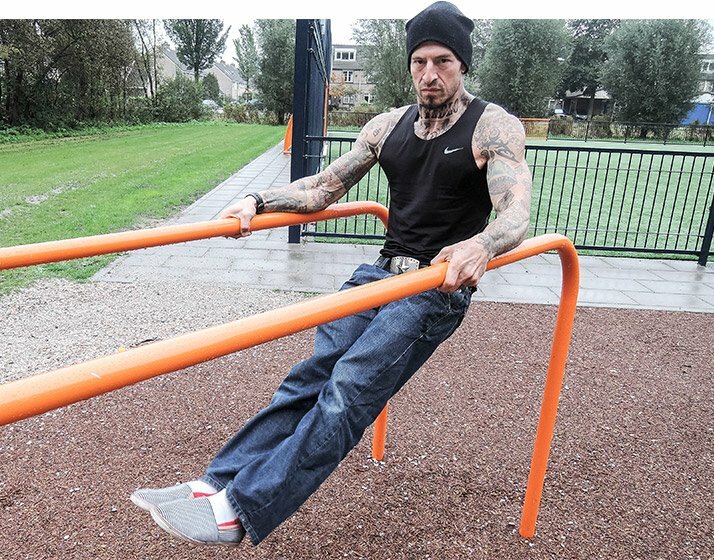 You will need to generate enough force from the bottom position of the classic dip to push your body so hard that you come up off of the bars. Be mindful that you will need to be prepared for the impact of when your hands return to the bars. This is an advanced dip variety that's not meant for newbies. Get even more advanced by adding a clap! The other dip variations are performed on a set of parallel bars. Not this one. However, it is more than the apparatus itself that distinguishes the straight-bar dip from the pack. First of all, the straight-bar dip places the hands at a different angle than the others. This angle requires more raw gripping strength, since the palms are facing the floor rather than facing each other. The simple change of turning the bar 90 degrees puts you at a far greater mechanical disadvantage, and with it comes a viable chance of "slipping" around and off the bar that does not exist with parallel bars. The upshot: You'll need more mettle on the metal! However, as everyone who has gone down (or up?) the muscle-up rabbit hole can attest, probably the biggest difference when switching to a straight bar is that it requires more core power to maneuver your body around the bar, as opposed to in between two bars. Good luck! These variations only scratch the surface. Feel free to experiment, get creative, and have fun! When you are passionate about your training, the sky's the limit. Let me know of any variations I may have left out in the comments section below. Dip it good, my friends.